In the 3-4th episodes of The Legend of Dugu Chinese Drama, Ban Ruo decides to give up Yuwen Hu after his henchman Ge Shu hurt Jia Luo, and wants to marry Yuwen Yu who is going to be next emperor. Man Tuo begins to drift apart Yang Jian after knowing the prediction of The Legend of Dugu. Jia Luo flees to tower of Yuwen Hu’s house and burns the stuff in the tower to inform others, Ban Ruo takes Yang Jian and Yuwen Yong arrives and wants to save her. But saving her is impossible as the flame is too tough. Yang Jian takes clothes and lets Jia Luo Jump down, but the clothes is broken when she jumps down. He hugs her so that she doesn’t hit the ground, but she faints. Dugu Xin gets angry when seeing his injured daughter and claims he will accepts the prime minister position, Yuwen Hu knows nobody will believes him if he says that he didn’t do it. Ban Ruo shoots angry eyes to Yuwen Hu and claims she will end their relationship if he hurts her younger sister again. Ge Shu wants to kill himself to atone for his sin, but his master stops him. Man Tuo gets angry because nobody told her Jia Luo was in danger, but she leans in Yang Jian’s shoulder with smile when seeing him. Yuwen Hu is upset when he misses Ban Ruo, he got marry with princess, but Ban Ruo is his true love. Dugu Xin became the prime minister, everybody thinks he will break Yuwen Hu’s autocracy. Jia Luo wants to go out when she recovered, Ban Ruo stops her with cold emotion, Jia Luo has to ask her her love story, Ban Ruo tells her woman may fall in love with bad guy sometimes. 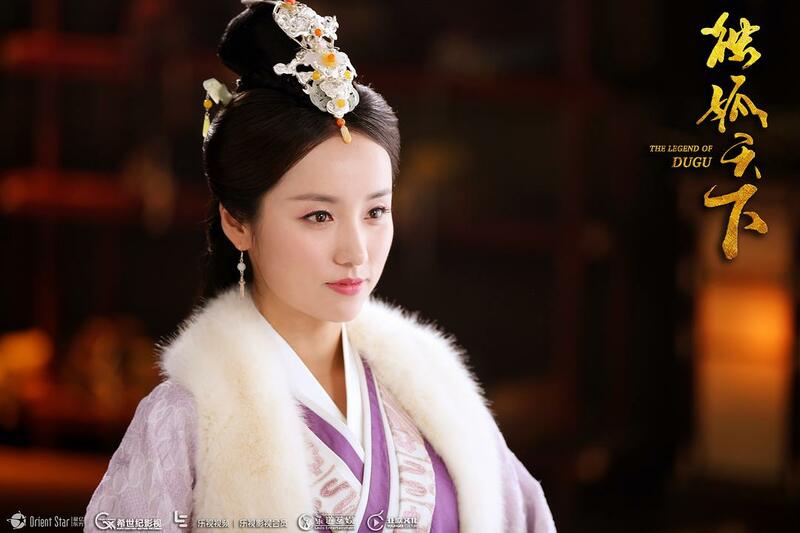 She persuades her father not to force Yuwen Hu too tightly and be careful his revenge. Dugu Xin cannot believe his daughter has the relationship with Yuwen Hu, Ban Ruo thinks she has to be queen as previous emperor discovered Dugu family is going to rule the world. But she understands Yuwen Hu cannot be controlled and his henchman has his mind, she wants to marry Yuwen Shu as emperor Yuwen Jue will gives the throne to him because he doesn’t have child. Dugu Xin doesn’t expect his daughter to sacrifice herself and marry Yuwen Yu, he wants her to get marry with the person she loved, but Yuwen Hu is his deadly enemy. He decides to arrange Man Tuo and Yang Jian’s wedding, looking for a person as Jia Luo’s husband, but he denies it and reveals he won’t put eggs in same basket when Pan Ruo thinks Yuwen Yong is a ideal person. Yang Jian pretends to get sick in the palace and is sent to Dugu Xin’s house when Yuwen Hu is going to withdraw his father’s military power. Yan Jian catches the chance to hugs Man Tuo from her back when she visits him with medicine. Just then Yuwen Hu sends doctor to see him, Yang Jian worries about it. The doctor finds out Yang Jian is ill after seeing him, Ge Shu has to leave with doctor. Yang Jian scream after they left, Jian Luo placed fire on his chest so that Yang Jian seems sick. Man Tuo find out Yang Jian isn’t the husband who can help her achieve the dream of The Legend of Dugu after asking him if he wants to be emperor. Ge Shu thinks Yuwen Hu shouldn’t force Yang Jian too tight as other generals will be against him, and asks if Ban Ruo is the girl who means to him. Yuwen Hu tells him that Ban Ruo helped him when he was bullied by Yuwen Jue. Yuwen Hu runs into Ban Ruo in Dugu Xin’s yard, she recalls he kissed her and promised to help her achieve the dream of The Legend of Dugu. He thinks she is going to marry Yuwen Yu and against him so that he grasps her neck, Jia Luo calls servants to catch him when seeing what he did on her sister. Jia Luo asks Ban Ruo why she didn’t stay together with Yuwen Hu since she loves him, Ban Ruo tells her that their family is in danger since emperor utilize their father to oppose Yuwen Hu and wants to achieve the dream of The Legend of Dugu. Jia Luo wants to help Ban Ruo, Yuwen Yong thinks Dugu Xin doesn’t want his daughter to marry him because of his birth. Emperor sends Yuwen Yong to Tong Zhou because he didn’t stand by his side when facing Yuwen Hu. Jia Luo chases Yuwen Yong and wants to ask her father to keep him after knowing he is going to leave. He kisses Jia Luo’s forehead and promises to marry after he is victory. Jia Luo tells Yang Jian that Yuwen Yong loves her and upsets, Yang Jian thinks she is still a child. Dugu Xin tells Ban Ruo that Yuwen Yu expressed his intention, and asks his daughter if she made the decision. Ban Ruo sends a letter to Yuwen Hu and asks to have a meet, Jia Luo worries her elder sister.